Guitarist Bill Frisell (left) and composer Michael Gibbs were awarded honorary doctor of music degrees by Berklee College of Music during a concert celebrating Gibbs’s 80th birthday. 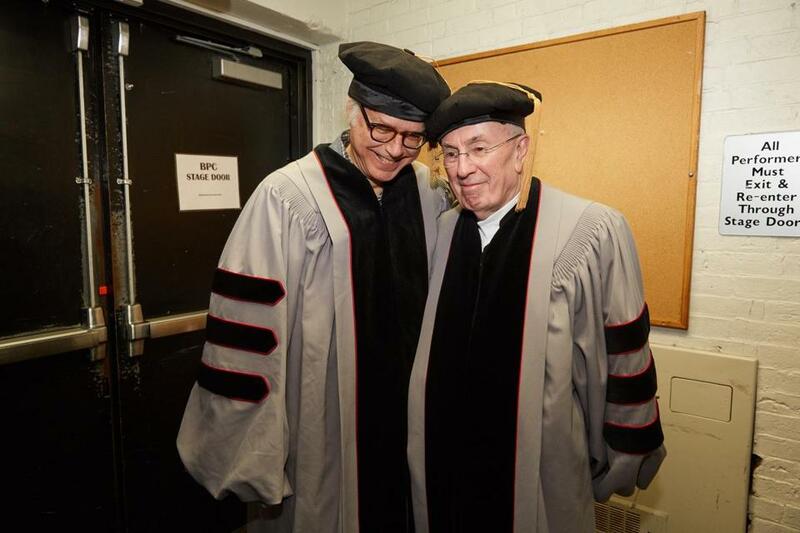 Celebrated guitarist Bill Frisell and composer Michael Gibbs received honorary doctor of music degrees from Berklee College of Music during a concert celebrating Gibbs’s 80th birthday. Presenting the degrees, Berklee’s president, Roger Brown, said Gibbs’s influence “cannot be overstated.” Burton dedicated his first-ever solo performance of “Sweet Rain,” a Gibbs composition, to “my school friend — we were in class together back in the day.” Gibbs conducted the concert finale himself, closing with a series of dramatic crescendos that left the audience spellbound. Frisell and Gibbs join a star-studded roster of Berklee honorary-degree recipients, including Duke Ellington, Aretha Franklin, Dizzy Gillespie, Quincy Jones, Smokey Robinson, Steven Tyler, Loretta Lynn, Juan Luis Guerra, and Annie Lennox, among others.